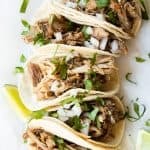 Slow Cooker (affiliate link) Pork Carnitas Tacos. Tender and juicy with just the right amount of spice and perfectly caramelized bits. The best filling for tacos, burritos and more! In a small bowl combine the cumin, chipotle powder, salt, oregano, and black pepper, stir to combine. Rub down the pork roast with the seasoning. Place the roast into the slow cooker (affiliate link). Add the quartered onion, minced garlic, sliced jalapenos, and orange juice. Cook over low heat for 6 hours. Remove the roast from the slow cooker and shred. Save the juices from cooking the meat. (I like to save the juices in a sealed plastic container, I use it when crisping the meat, and also save it for helping to reheat any leftovers). Heat olive oil in large cast iron skillet. Add the shredded meat in a single layer in the skillet. Spoon excess juices from cooking the meat, over the meat in the skillet. Cook on high heat until bits of the meat begin to crisp and caramelize. Then remove from the heat. How Many Pounds of Pork Do I Need?– The general rule is to use 1/3-1/2 pound of pork per person when shredding the pork. Cook Times Per Size: 1-3 pounds follow the recipe as stated 6-8 hours on low. 3-6 pounds 10 hours on low or 6 hours on high. 6-8 pounds 12 hours on low. Pork should be cooked to an internal temperature of 190-195. BUT it will shred and fall apart perfectly once it reaches 200. There is no need to remove the fat from the pork before cooking, most of the fat will cook off, and if there is excess amounts of fat it can be removed later. How to make this recipe on the stovetop: follow the recipe, except place all of the ingredients in a large dutch oven with the lid on, cook over medium heat for about 2-3 hours, checking to stir/move the meat around periodically. Once the meat is easily shredded, remove it to shred and then add it to a large cast iron skillet to crisp up. How to store this meat: leftovers of this recipe hold up very well. My favorite way to keep them is to keep the meat in a sealed container in the fridge, and then I keep the liquid from cooking in another container. That way when I reheat the meat I can add more juice as needed to keep the meat juicy. When storing the liquids there is no need to skim the fat out unless you want to. After chilling in the fridge it will separate and you can use it or discard it and just use the juice.